Just had a call from John Knobel, Bondi local in the 50s and 60s. That’s him standing second from the left in front of the red balsa malibu, wearing his home-made blue board shorts with a snazzy rope belt. 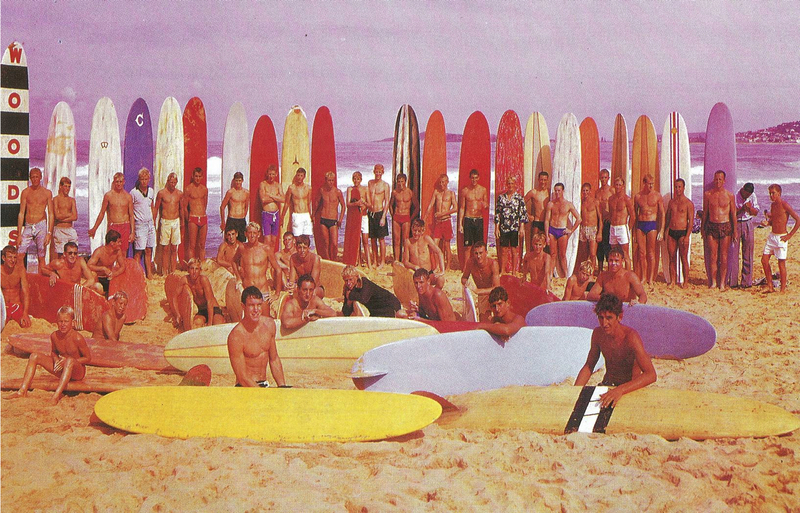 John surfed on a Norm Casey hollow 16 foot toothpick before the malibus arrived in Sydney in 1956 although he was never part of the lifesaving scene. As a youngster he wheeled his board the few blocks to the beach on a hand cart made from a packing case. The switch to light-weight balsa in the late 50s was an amazing break through because “they could be thrown about from the tail” and unlike the old longboards were thrilling to ride. It was also pretty clear that shorter boards meant more fun in the surf, so his early boards were under 9 foot. John also recalled hopping over the back wall into the lifesavers’ change rooms at Bondi to rescue surfboards impounded by the likes of Aub Laidlaw. I remembered that John Knobel gave me a copy of this image taken on the same day as the Teenager’s Weekly shoot. Peter Bowes sent through a few names.. Subscribe to comments with RSS or TrackBack to 'John Knobel, Narrabeen, Teenager’s Weekly 1962'. Thanks Pete – where were you…?